ENJOY 1 FREE PILATES CLASSE (WORTH $65) WHEN YOU PURCHASE 1 OR MORE VOUCHERS! Offer limited to first 50 vouchers sold. 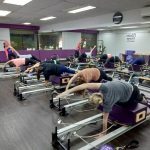 Each voucher at $200 entitles you to 5 Pilates Fitness group classes. Enjoy 2 FREE Pilates group classes when you purchase 1 or more vouchers in a single transaction before 23 December 2018. Voucher redemption is valid till 31 May 2019. Once voucher is redeemed, the 5 classes are valid for 6 weeks from redemption date. As such, the voucher classes are valid for use till 14 July 2019. Original voucher must be presented for redemption. Voucher can be used for all group classes at Pilates Fitness studios. Booking before each class is required. You can book your class online here. This voucher cannot be redeemed for cash and cannot be used in conjunction with any promotions from Pilates Fitness (not valid with birthday, renewal, groupon, trial, referral promotion). You can use the classes from the Vouchers to participate in the monthly Flow Challenge. Pilates Fitness Pte Ltd reserves the right to change the terms & conditions of the offer without prior notice. No joining fee required to start using the vouchers. No consecutive or back to back classes allowed.